Kite Pharma, one of the hottest biotech start-ups on Wall Street, hopes to revolutionize the treatment of a common, deadly lymphatic cancer — with a novel mix of highly trained lab techs and high-speed air travel. The Santa Monica company’s treatment of non-Hodgkin’s lymphoma reprograms a patient’s T-cells — the kind that are supposed to fight disease — to seek and destroy only abnormal, cancerous lymph cells, not the healthy ones crucial for human life. But in order to do so, blood must be drawn from a patient, refrigerated and flown to Kite’s headquarters, where the cells are modified, frozen and then flown back to doctors who re-inject them into patients. Dr. Arie Belldegrun, Kite’s founder and chief executive, likens the two-week process to installing a navigation system in a car. “The GPS will lead you to the cancer cell, and not the normal cell, and selectively kill only the cancer cell,” Belldegrun said. Although it could be a year or longer before the FDA approves its treatment for non-Hodgkin’s lymphoma, the clinical results are so promising that Kite has forged ahead with constructing a 44,000-square-foot facility that would become its cancer-fighting nerve center. It’s going up in El Segundo, better known for its cluster of aerospace companies, because the city is right next to Los Angeles International Airport, making it faster and easier in traffic-clogged L.A. to ship and receive T-cell specimens. In addition to non-Hodgkin’s lymphoma, Kite plans to use T-cell modification to treat leukemia and many other types of cancer. The company’s success would help raise the profile of the Los Angeles County biotech community, which has several standout firms but has lagged behind the San Francisco Bay Area and San Diego. Even without a single approved drug, Kite shares have soared 283% from last year’s initial public stock offering of $17. The shares closed Friday at $65.07, giving Kite a market capitalization of nearly $3 billion. Still, Kite faces regulatory challenges as some patients have experienced significant side effects. Kite also will have to fend off competition from Juno Therapeutics Inc. of Seattle and Swiss pharmaceutical giant Novartis, which are pursuing immunotherapy treatments for non-Hodgkin’s lymphoma and other diseases. Kite’s promising treatment for non-Hodgkin’s lymphoma is called KTE-C19, which is in a clinical trial. It involves attaching an antibody to a T-cell that enables it to recognize and attack cancer cells. The testing is expected to conclude next year and sales could begin in 2017, assuming the Food and Drug Administration gives its approval. The treatments could cost $100,000 or more, putting it into a growing class of new drugs with controversial, sky-high price tags. Still, there should be no shortage of demand. About 550,000 people were living with non-Hodgkin’s lymphoma in the United States in 2012, according to the National Cancer Institute. Analysts expect the drug, which is aimed at patients with advanced cases of the disease, to generate more than $1 billion in annual sales. Kite’s KTE-C19 would be the first T-cell modification approved for treatment of the disease. Immunotherapy’s targeted approach is a huge advance over chemotherapy, which involves injecting toxic chemicals into the body, potentially damaging healthy cells, said Jason McCarthy, a biotech analyst with Maxim Group investment bank in New York. Belldegrun, 65, is an Israeli-born cancer doctor with decades of experience in immunotherapy. He served as a research fellow at the National Cancer Institute under Dr. Steven A. Rosenberg, who pioneered the science of turning the immune system against cancer. In 1996, Belldegrun founded Agensys Inc., a Santa Monica biotechnology company that developed several cancer therapies before it was sold to Astellas Pharma Inc. in 2007 in a deal valued at more than $500 million with incentives. Belldegrun launched Kite in 2009, took it public five years later and has recently overseen a rapid expansion. It now employs about 150 people, up from just eight at the beginning of last year. The company has spent about $100 million on research and development, but still had $403 million in cash and other assets as of June 30, much of it from its $134-million IPO and private equity investors. It has no debt. Kite has partnership agreements with the National Cancer Institute and Amgen, which were announced this year. 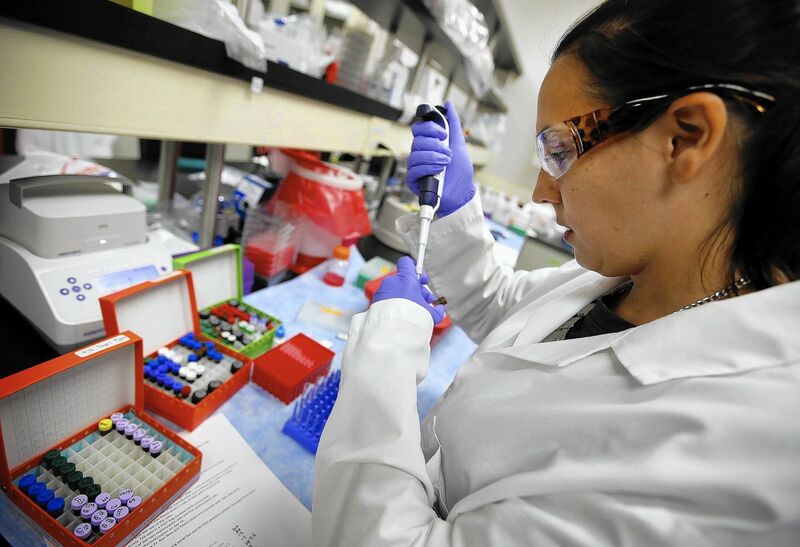 The Thousand Oaks biotech giant invested $60 million to partner on the pursuit of treatments for other types of cancer. Kite recently announced positive results in early testing of a treatment for cancers caused by human papillomavirus, or HPV. The sexually transmitted virus causes cervical, neck and back cancer. Dr. David Chang, who left Amgen to work as Kite’s chief medical officer, said he sees enormous potential in the company’s pipeline of cancer therapies. “The best way to describe where we are now is the early days of Amgen,” said Chang, who had served as Amgen’s vice president of global development until last year. The agreement between Kite and Amgen would allow each company to receive more than $500 million for each approved cancer treatment, if a series of undisclosed milestones are met. “The intersection of immunology and oncology represents one of the most promising approaches to delivering significant impact for patients with cancer,” said Sean Harper, executive vice president of research and development at Amgen. Analysts said they believe that Kite is leading the race to get the first non-Hodgkin’s T-cell immunotherapy treatment to market. Belldegrun said he believes that immunotherapy will eventually pass chemotherapy as the go-to treatment for non-Hodgkin’s lymphoma, a disease that causes about 30% of patients to die within five years of diagnosis. Though Belldegrun has been effusive in describing the clinical trial, he has declined to provide specific results until a December meeting of the American Society of Hematology in Florida. Some patients have had complications. Last year, the company said that several patients experienced side effects that included fever, low blood pressure, neurological deficits and delirium after receiving the infusions. Belldegrun blames the side effects on the extraordinary effectiveness of the treatment, which leads to an accumulation of dead cancer cells in the bloodstream.